Skid steer tires are the most expensive, consumable component of a skid steer. It is critical to be aware of ways to ensure that you get the maximum ROI on your skid steer tire investment. By nature of how they are designed to operate, skid steer tires are prone to wear. ‘Skidding’ as they turn, spinning wheels and being operated under the most demanding work site conditions contribute to a skid steer tire’s wear over time. The type of application affects tire wear and tire life. Some skid steer tires operate better on certain applications than others. For example, pneumatic (air-filled) tires are well-suited for general purpose work where there are no sharp objects that could puncture the tires. On the other hand, for debris-filled job sites, solid tires – which are 100% flat-proof – can withstand such demanding underfoot conditions where sharp-edged debris pose a problem. Matching your tires with the right application eliminates the problem of premature wear and damage. Tires come in different types, styles and lug patterns. Pneumatic tires are typically standard-duty, heavy-duty or severe-duty. Each type is specially engineered for optimal performance in specific applications. 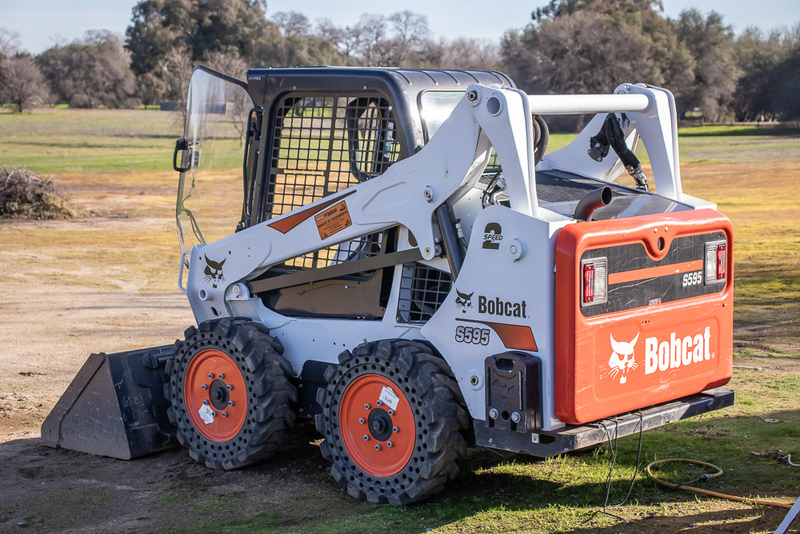 Standard duty tires are an economical solution for low-use skid steer operations like landscaping. Heavy-duty tires feature extra thick sidewalls and a rim guard that protect them from damage. They are well-suited for applications like farming, snow removal, rentals, and general construction. Severe-duty tires are manufactured with extra layers of rubber and perform optimally on demolition sites, scrap yards, and industrial applications. To maximize tire life, it wouldn’t make sense to use standard-duty tires on demolition sites. Always make sure that the appropriate type of pneumatic tire is used on an application. To eliminate the issue of flats, foam-filled tires should be used on those terrains prone to causing tire flats, i.e. debris-filled terrains. Foam-filled tires are basically pneumatic tires in which the air in the inner tube is replaced with a poly-fill. In some challenging environments, foam-filled tires can easily get damaged, causing the foam to leak out which renders the tires useless. For those severe work site environments, you’re better off pairing your skid steer loader with solid tires. While more expensive than foam-filled and pneumatic tires, solid tires are extremely durable, made from tough, resilient rubber compounds. They are the go-to tires for a range of industrial applications as they are puncture-resistant and 100% flat proof. This makes them well-suited for severe skid steer operations in recycling plants and on demolition sites. It is not enough to choose between pneumatic, foam-filled and solid skid steer tires. When selecting tires for a job, consider the different tread patterns available. Some lug patterns will wear out faster than others if the pattern is not well-suited for the application. For instance, for muddy terrains, you would typically choose tires with deep, wide tread lugs that offer maximum traction. However, for hard surfaces, these tires would wear out quickly, and it is better to use tires that offer more rubber-to-ground contact surface area as this minimizes wear on abrasive surfaces like asphalt and concrete. Operators directly impact tire longevity. It is an operator’s responsibility to adopt the proper operating techniques to ensure that tires do not wear out quickly. Make Wider Turns: For a skid steer to provide a full turn radius, the wheels counter-rotate against each other. Instead of making a lot of tight turns, if possible, the operator can opt to make wider turns. By reducing the amount of tire counter rotation, an operator can significantly minimize tire wear caused by wheel counter-rotation. Minimize Tire Spinning: Limit tire spinning, especially on hard, abrasive surfaces where tire spinning leads to higher friction against these abrasive surfaces. This causes the tires to wear out fast. Tire Inflation (Pneumatic Tire): The tire pressure should always be at the manufacturer’s recommended levels for optimal performance and safety. Doing this maximizes tire life. Speed: Always run your skid steer at the recommended speed level to minimize internal heat build-up and reduce tire wear. Load Weight: Never go over the recommended load weight for your equipment. Heavy loads put a lot of pressure on tires, which can lead to stress cracking over time. By staying within the weight limits the skid steer manufacturer has recommended, you extend the life of your tires. Daily Tire Inspection: Visually inspect your tires daily to make sure no debris is lodged in the tires that could cause tire damage. Also check the tire tread for wear, chunking and cracking. Tire Rotation: To ensure even front and rear tire performance, tire rotation is a must. Depending on how the skid steer is operated, tire stress may be more prominent in the front or rear tires. Rotating the tires ensures that the tires on a skid steer all wear at the same pace, more or less. This entry was posted in Skid Steer, Tire Options. Bookmark the permalink.